She spent a great deal of time reading books by P.L. Deshpande to P.G. Wodehouse, or anything that interested her in that moment. “However, I didn’t specifi cally read up on pregnancy or parenthood. It was just whatever caught my fancy. I even studied Spanish while I was expecting. Surprisingly, Arin loves listening to Spanish songs,” she says. “The rest of my pregnancy was honestly a breeze. I really did enjoy my rather traditional baby shower. According to Maharashtrian tradition, I had a Dohale Jevan. Dohale means ‘pregnancy cravings’ and at this ceremony, whatever an expectant mother craves, it’s cooked and fed to her. She’s pampered and showered with a whole lot of love. Fortunately for me, I got to enjoy this not once, but several times during my pregnancy. At the shower, though, I thoroughly enjoyed being dressed in fl oral ornaments and had my picture taken on the man-made moon,” she says. “After all the excitement and love I received, I realised just how much I would miss being pregnant, and somewhere, even hoped it would last just a little longer. But, Arin had other plans in store for his papa and mama, and on the 15th of November, 2016, I went into labour,” she says. However, after six hours of labour, the doctor took a call to do a C-section because Arin was breeched, and a normal delivery would be a lot harder, given her age. Finally, at 10.06 p.m. Arin was born. “I was semi-conscious when doctor told me it was a baby boy. All those nine months, weeks of nausea, worry and excitement culminated in a few hours of labour, but ultimately, in my greatest achievement. 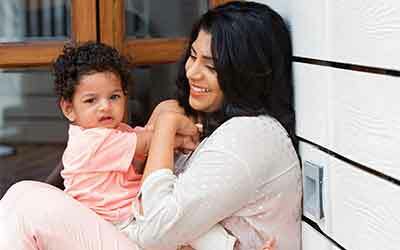 This was indeed a beautiful beginning to motherhood,” says Aditi. After bringing Arin home from the hospital, the couple realised just how much their life had changed. Everything was suddenly all about the baby. “Motherhood was nothing like I imagined it. It was a completely different phase—there was plenty of excitement, happiness, challenges and stress. 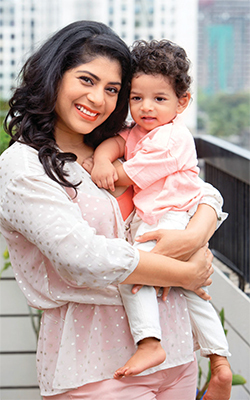 I thought motherhood would be a cakewalk but reality set in with the lack of sleep, the inevitable worry and pressure of being responsible for another life dawned on me; it was a rollercoaster of emotions,” admits Aditi. For the actress, no amount of faking the smile could soothe her nerves. “The baby blues were just not relenting; sleepless nights turned into fear. The fact that I was alone and had no real help with the baby and managing our home, just became a nightmare for me. That’s when I realised that this was more than just baby blues and I could possibly be suffering from postpartum depression. I decided I needed help, and consulted with M&B panelist, Effath Yasmin. The initial consultation made me realise that breastfeeding was quite the task because Arin didn’t latch properly. He also experienced a discomfort in his neck because of tongue tie. Arin also also suffered from post-delivery trauma. Effath helped me come out of this difficult phase through craniosacral therapy and actually made me feel like I could do this! While I did have a rough start, today as my baby gets older, I can see just how beautiful my journey has been. I’m definitely emotionally independent, confident and so much more at ease,” she explains. Today, it’s a whole different experience. Arin, fortunately, slept through the night from day one, and kept the new parents awake during the day. “I was definitely thankfuly for small blessings like these,” says Aditi. But acording to her, the real fun began when he turned four months old. “Arin recognised my touch from the second month but the actual communication started from the fourth. Every first was special. His first touch, first feeding session, first cry, first twist, first outing, first vaccine, first poop, everything has been so special;we have it all on camera! And how time flies! He’s already eight months and has started crawling. It’s getting hard to keep up,” she jokes. “If that’s not all,” she continues, “he even has preferences. He understands what’s good and what’s not; what’s tasty and what’s not. I’ve come to realise that breastfeeding was much easier than weaning. But thankfully, he’s not too fussy when it comes to food. Eats everything if given to him on time. But the cutest thing about him is that he loves to sleep. Sleep takes precedence over food, and if he’s sleepy, nothing can get in the way of him and his bed!” she says with a laugh.